Commercial drivers on the Coquihalla have a lot more room to equip their vehicles with chains now that the Box Canyon chain-up facility has expanded from 14 to more than 70 parking spaces. But the larger site will be unchartered territory for many professional drivers this winter. Whiteout conditions combined with road markings hidden by snow and ice could make identifying parking spaces and through lanes difficult. So, to help you prepare for the next big winter storm on this busy mountain pass, we produced a video that guides you through the facility using aerial drone footage and pop-ups identifying various site features. You’ll note in the video that when the Coquihalla Protocol is activated, and the mandatory chain-up signs are flashing, there will be three traffic control people onsite directing drivers through the expanded chain-up, which is located northbound on Highway 5, about 32 kilometres north of Hope. 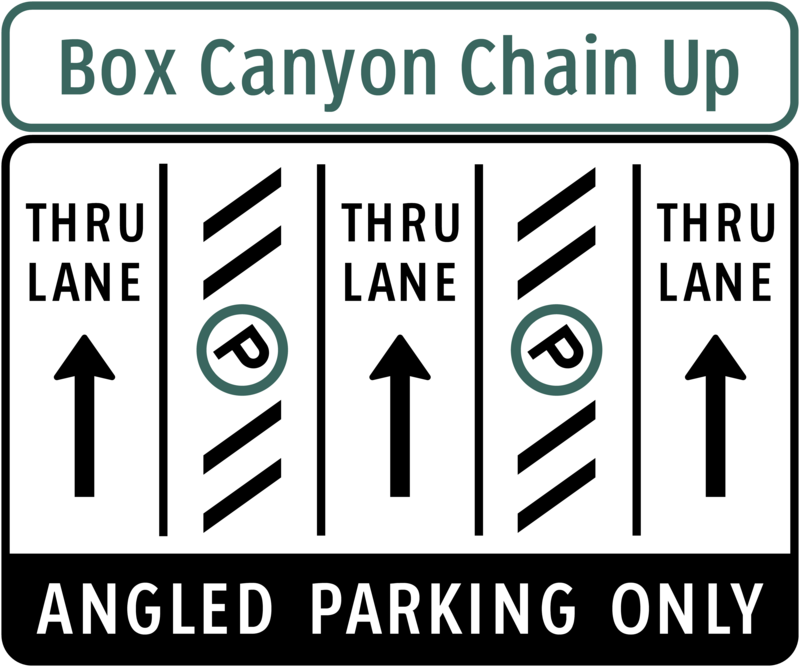 Please keep in mind, Box Canyon chain-up facility is for chaining up only. You are not permitted to remain parked beyond that time. This ensures incoming drivers have space to chain up. The new facility comes a year after the Coquihalla summit experienced a total snowfall of 830 centimetres from Oct. 1 2017, to the end of February 2018. That’s 114 per cent higher than the 10-year average. Remember: commercial vehicles must carry chains on most BC highways from Oct. 1 to March 31. For select highways, including mountain passes and rural routes in high snowfall areas, the date is extended until April 30 to account for early-spring snowfall. Simply carrying chains is NOT enough! Equipment is useless if you don’t know how to use it. So, please ensure you know how to install chains before setting out. Got a winter driving tip for those fellow professional drivers who may not be as experienced through mountain passes in winter? Leave a comment below. When snow covered, the lines will not be visible. Doing this angle parking at the top Zopkios should be a excellent idea as well !! Having tridems and trains chaining up before the 5 axles should be enforced. It’s a shame once a train spins out, everyone has to chain! Yes experience does help, but why should ones person inexperience make all the rest throw chains prematurely? Hi Mark and thanks for your comment. The lane configuration sign is at the entrance point to the chain up area for drivers to see. Part of the reason we created this video was to help drivers understand how to use the facility should the markings be less visible due to snow. Having the right chains is pointless without a matching key! When the time comes… GidRdun! Thanks for your comment Marcel! For the most part it is super b trains and multi trailer combinations that are spinning out and causing the headaches and problems on this road. Why when there is a big snowfall expected are they not rerouted through the canyon? We sent your question to the local area manager who confirmed that, typically in BC, we only restrict vehicles due to physical limitations – be it weight or size. Drivers are warned prior to the corridor of chain up requirements etc., and checked at the staging site for chains. We are hopeful that drivers can make the decision based upon their experience and configuration. He also noted that alternate routes do present challenges of their own. Hope this response is helpful! Now if only there were people before the chain up forcing truckers to go into the chain up area and actually chain up when required…instead of bypassing it and thinking they can…maybe you wouldn’t have issues shown on say Highway Thru Hell when Snowshed Hill becomes a virtual parking lot. Thanks for this feedback Ken. We have shared it forward and will let you know what we hear back. We have several signs leading up to the facility that identify the chain up area, and a flashing sign that indicates when trucks are required to chain up. Our traffic control typically sets up within the chain up area to ensure the site is managed efficiently. We can’t have trucks queue onto the highway, as there is an avalanche path immediately south of the chain up area. Our CVSE attend protocol events, where more than 15cm of snow is forecast in a 12 hour period (when mandatory chain up is anticipated). The CVSE officers are positioned at the exit of the chain up facility, as they can only enforce violations, and a violation only occurs when a truck passes the exit of the facility without having chained up. Hope that this answer helps clarify our procedures!